Pro Evolution Soccer 2015 / PES 2015 has been announced to be released worldwide on November 23rd. This is rather surprising as the game has traditionally been released in September. According to Konami, this new title will boast advancement not only in gameplay, but also in its graphics and AI that will take advantage of the power of the new generation gaming consoles. Here are some of the advancements we can look forward to. PES 2015 now has the all new myClub, which is a revamp of the old Master League Online to allow players and managers to be added using GP points accumulated by the user. It can now also be done through micro-transactions within club deals. And as an added flavor, players can now be affected with their “happiness” towards the current team where they belong. Unhappy players will be able to significantly influence the team to a damaging level. Managers must always to keep the team spirit high as it can now affect the teamwork in the field. Also, Pro Evolution Soccer 2015 has the new role control system which will now enable you as a user to divide the control of defensive, midfield and attacking roles with two of your friends. This allows you three to fully enjoy the multiplayer mode by designating key positions where you play best. The teamwork then is carried over not only for the AI of PES 2015, but also for real life users as well. Cooperation then is the key for every multiplayer game where your team of users will be pitted against the game artificial intelligence or another team of live players. If you are the type of game user that loves editing, you will have a good time with the ‘unlimited edit modes’. PES 2015 is giving you back the ability to edit your stadium with the stadium editor. You can have your personal choice in side line colors, pitch patterns, seat colors, and even the design for the goal net. 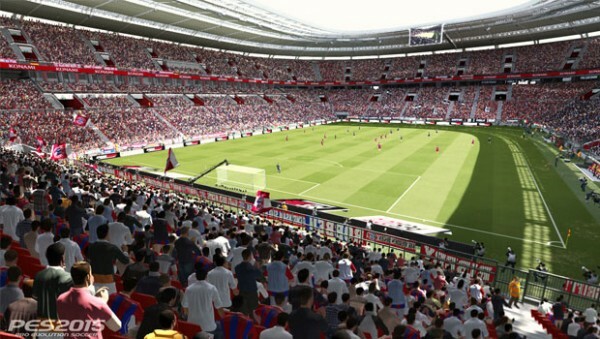 PES 2015 even added the stadium editor with the new licensed stadiums. You also now have the ability to edit your manager, edit stats of new players and even the base copies for all players. The online mode of Pro Evolution Soccer 2015 has also been improved through its quick matches that will have ranking match-ups to speed up online gaming. You can also aim for promotion or face relegation by acquiring points in online matches across a season. If you wish to participate in a game with a large number of players, there will be Lobbies that will be dedicated to eleven versus eleven matches as well. There will also be a new courtesy system in PES 2015 to reduce online cheating. PES 2015 rebuilt its player parameter system making each of the players’ stats as accurate as it can be. The developers collaborated with the different key community sites all over the world to gather this extensive amount of information. Each player within the game has statistics that are as realistic as possible. This in turn resulted in having players who not only look like their real life counterparts, but play like them as well. With over 1000 players faithfully recreated by the developers, animations and playing styles were meticulously integrated to the entire player roster. The animation for each player was also vastly enhanced. They play as they do in real life, run the same way and even react with almost genuine emotion to different calls the referee may make, including fouls and violations. This emotion also greatly affects the way they play within the game, with reactions that imitates what real players will do in real games. Yet even with all these enhancements to animation, the response of each player to the users’ controls is never compromised. Movements still flow with no effort at all and are still calculated in real time. This will still be dependent on the position and speed of the ball. The menu was also recreated to make it a lot simpler than previous installments. PES 2015 offers a more effective menu system, with modes that are preferred by users easily accessible, resulting in more time spent on playing and less time on the menu. The atmosphere of a real match is recreated in the game as well. This is done through enhanced crowd noise. The crowd animation is improved, with their reactions being affected by how their favorite team is playing. Their reaction becomes sensitive to the entire flow of the game, replicating how real life crowd react, especially during critical matches. The improvements of PES 2015 show great promise. That said, we players have always hoped for great things each year, and there will be some areas that let us down. Let’s find out if this is the year which PES regains its former glory. The demo will be released on September 17th. Looking forward the Demo and hope myClub is really balance between player and payer!